By the end of this post, you will know how to do probiotics right — by testing first and then taking quality probiotics, if necessary, to restore a healthy balance. When a person’s gut microbiota is imbalanced or becomes more pathogenic, we see more autoimmunity, digestive disorders, cardiovascular disease, diabetes, cancer, and unhealthy expression of hormones and brain chemicals leading to mood disorders, depression, and anxiety. As explained later in this post, lab tests are now available to identify the specific microbes populating the gut, so that your treatment provider can evaluate your specific needs and recommend targeted treatments and actions you can take to restore a healthy balance. To better understand the relationship between good, opportunistic, and pathogenic microbes, imagine them as cops and robbers. The cops stand guard, maintain order, serve, and protect. If a community reduces its police force or weakens it by taking away its weapons, cutting its budget, or placing restrictions on how they conduct investigations, then opportunists are likely to find crime more attractive, and the real bad guys will become bolder. Over time, the opportunists and bad guys overwhelm the cops’ ability to maintain order, and the entire community suffers. The community also suffers if the police force is corrupt or overly aggressive. If law enforcement suppress the entire population or even kill off some of the good guys, the productive members of the community, no longer have the freedom to thrive. However, if the community maintains a robust police force, provides sufficient funding, and fosters good community relations, productive members of the community thrive, opportunists are kept in check, and the bad guys are prevented from doing too much damage. The same is true of the gut microbiota. You want a thriving community of good bacteria that prevents the opportunists and pathogens from getting the upper hand. However, you don’t want overly aggressive police force (antibiotics) that kills both good and bad microbes, because that creates an imbalance that allows the opportunists and pathogens to gain traction. Likewise, you want to avoid foods that contain pesticides and herbicides (such as glyphosate) that do essentially the same thing — kill off both good and bad microbes and disturb the sensitive balance. Exercise has been shown in both animal and human studies to influence the gut microbiota, increasing diversity and providing for better ratios of good to bad bacteria. 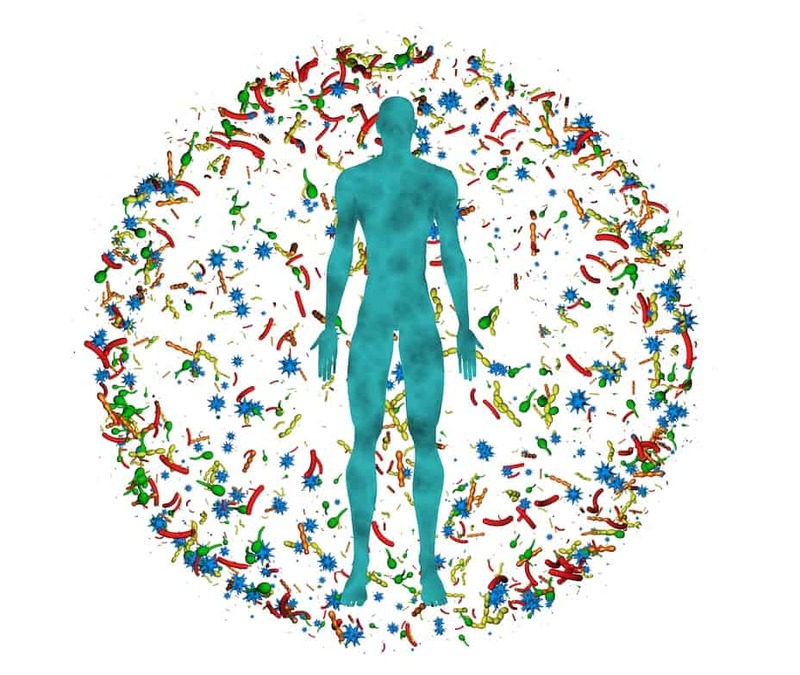 The ratio of Bacteroidetes and Firmicutes — the two most common bacterial families in the gut microbiota — is directly associated with body composition. Obese individuals have significantly higher levels of Firmicutes and lower levels of Bacteroidetes compared to normal-weight and lean adults. Animal studies confirm that repeated exercise can increase Bacteroidetes and decrease Firmicutes, which favorably alters the microbiota to support a healthier body composition. Eat a balanced diet complete with vegetables, fiber, healthy protein sources, and fat. In other words, start feeding your microbiota what it needs to be healthy. Limit your consumption of sugar (including soda, alcohol, fruit juice, and other sweet drinks) and processed foods. This tactic starves the opportunistic and pathogenic microbes. Engage in intense exercise regularly. Vigorous exercise changes ratios of bacteria to favor weight loss by having the bacteria increase your metabolism. Avoid antibiotics and reduce your reliance on prescription medication. Find ways to reduce stress at home and work. Remember, to a large extent, you are in control of your microbiota. However, because our culture is inundated with stress and encourages overuse of medications, poor food choices, and a sedentary lifestyle, our microbiota suffers the consequences, and our health suffers from the resulting imbalance. Many people are reaching for probiotics and experiencing different results. Some feel better, others feel worse, and many feel no change at all. To reap the most benefit from probiotics, do it right — test first. Don’t blindly take probiotics anymore! Thanks to DNA-PCR technology and the insights gained over the last twenty years of researching the human and gut microbiota, today a simple stool test can pinpoint healthy microbes and pathogens in your microbiota. At BioDesign Wellness Center, we use the GI Map DNA test to check for the quantity and ratios of good bacteria and opportunistic bacteria. Here at BioDesign Wellness Center in Tampa, we commonly run stool testing on those who have digestive complaints, autoimmunity, environmental health issues, chemical sensitivity, obesity, or an inability to lose weight. With test results in hand, we can look for pathogens including but not limited to H-Pylori, Salmonella, Clostridium Difficile, parasites, protozoa, and viruses (including Epstein Barr and the Noro Virus, which is found on cruise ships). In addition, we look for chemical markers of inflammation that can differentiate between IBS or more advanced inflammation seen in Chron’s disease or Colitis. We see how well a patient is digesting food based on pancreatic secretions and fat digestion markers, and we look at Zonulin, a marker for leaky gut. Your stool is also checked for blood. Putting this all together we can then design a comprehensive plan to restore gut health. By having a map of your gut microbiota, we can see what is missing and what needs to be replenished. We can also determine whether something needs to be treated in terms of infection or inflammation. Targeted probiotics can then be used, now that we know what strains you are low on and which may be elevated. This is, of course, different from randomly taking a probiotic when we don’t know if it’s truly the one that needs to be replenished. Probiotics are only part of a comprehensive solution. Based on test results, we can tell whether you need prebiotics to feed good bacteria, anti-inflammatories to reduce gastrointestinal (GI) inflammation, nutrients to support healing of the intestinal lining, immune support to boost immunity during the healing process, and possibly support for digesting food in the stomach or gallbladder. The steps you take to heal your gut microbiota and restore optimal health will be guided by your labs, symptoms, and ultimately your healthcare provider (which we recommend be someone with training in Functional Medicine). Take the next step today. If you have any of the conditions mentioned in this post or you are not feeling as healthy and fit as you would like, schedule an appointment for an evaluation and testing. Don’t waste money on probiotics, prebiotics, and other supplements until you know what your body needs! Disclaimer: The information in this blog post on Gut Microbiota and Probiotics is provided for general informational purposes only and may not reflect current medical thinking or practices. No information contained in this post should be construed as medical advice from the medical staff at BioDesign Wellness Center, Inc., nor is this post intended to be a substitute for medical counsel on any subject matter. No reader of this post should act or refrain from acting on the basis of any information included in, or accessible through, this post without seeking the appropriate medical advice on the particular facts and circumstances at issue from a licensed medical professional in the recipient’s state, country or other appropriate licensing jurisdiction.